It all started on 23 November 2017 at the Gabba in Brisbane. The Aussies were trying to regain the Ashes after losing 18 months ago in England 3-2. The Poms would be without their vice-captain Ben Stokes following a ‘scuffle’ outside an England Bar. But anyway, England won the toss and elected to bat first at the Gabba. Starc got a quick wicket on the 16th ball of the innings, getting Cook to edge the ball towards the first slip where Handscomb dived to his right and took a great catch. Mark Stoneman and James Vince then had a great 125 run partnership before Pat Cummins got his first wicket of the series, bowling a beauty to Mark Stoneman and hitting the top of middle stump to get him out on 53 which brought in the captain Joe Root. Five overs later James Vince got run out 17 runs short of his maiden test ton thanks to a great throw from Nathan Lyon. Root couldn’t do much, getting out for 15 and giving Cummins his second wicket. Moeen Ali and Dawid Malan batted for 32 overs before Starc picked up his first wicket of the Magellan Ashes getting Malan for 56. Then in the very next over Nathan Lyon got England spinner Ali LBW for 38. The Australians picked up 2 more quick wickets getting Bairstow for 9 and Woakes for a four ball duck. Hazlewood and Starc got the last two wickets leading England to 10-302 after 116.4 overs. Time for the Aussies to Bat! The Poms picked up their first four wickets for a small 76 runs. Shaun Marsh and our captain Steve Smith put on a handy 99 runs before Shaun Marsh got caught on 51. Tim Paine and Starc got out quickly while Smith was running out of partners. Pat Cummins – Who was good with the bat throughout the series – stayed with Smith for 32 overs getting 42 and staying with the captain while he got his ton. Hazlewood and Lyon got 15 runs combined off 47 balls. Smith remained not out for 141. A great captains knock! We were all out for 328 giving us a 26 run lead. The Poms had starts from Stoneman (27), Root (51), Ali (40), Bairstow (42), and Woakes (17) but no one went on and made a big score. We bowled excellently, getting 10 wickets in 71 overs and only allowing 195 runs. The target was set, we only needed 170 odd runs and plenty overs to get them in. Openers Bancroft and Warner both brought up their fifties in style. Although Bancroft faced the bulk of the deliveries Warner got 87 not out off 119 balls, while The debuton got 82 of 182 balls not out. We got the runs in just 50 overs being 0-173. Smith had a match saving performance and lead from the front as a Captain. 2 December 2017- The day night test. Who doesn’t love it? The excitement of playing cricket at 8 o’clock at night is awesome. But like all games of cricket, it starts with the toss of the coin. Yet again England won the toss, Joe Root elected to bowl this time. England got their first wicket in the thirteenth over because of a mix up between Warner and Bancroft which lead to Bancroft getting run out for 10 runs. Warner batted with Khawaja for a bit before Warner edged it to the keeper off Woakes’ bowling. Next in was the dangerous Smith. Khawaja brought up his fifty but got out soon after. Next out was Smith after he got a slight edge onto his stumps. The rest of the squad got good starts except Starc. The stand out was Shaun Marsh though with his unbeaten 126. After 149 overs of batting Steve Smith called the declaration with us being 8-442. A very solid score. The English only got to face 76 overs before our bowlers knocked them over; lead by Nathan Lyons 4 wickets, “Niiiiiceee Garrryyy”! Pat Cummins was unlucky to only get the two wickets as he was bowling superbly during the night session of day two. He was so entertaining to watch and I’m sure everyone who watched the last 15 or so overs would agree. Although the two wickets he got were in that session were the big wickets of Root and Malan. But on England’s side of things they had about three starts with Cooks 37, Woakes’ 36 and Craig Overtons 41 not out. 10-227 was the final score which gave us a 215 run lead. Although we had the opportunity to enforce the follow on which would’ve meant England would bat again we decided against it. But the Aussies still had a bunch of overs left of that night session. The night session is hardest for the batsmen because the kookaburra ball swings a lot more under lights. In that session we lost Bancroft, then Khawaja, then Warner then Smith. After that we bought in Nathan Lyon to be our night watchmen. Lyon brought us some comedy after he got hit in the groin area and got the team physio to come out. He obviously dragged it on a bit to waste time which would then mean less overs under lights. We then lost no further wickets that session. As they were walking off for the end of days play England captain Joe Root had a few words to say to Nathan Lyon and Peter Handscomb clearly annoyed that the Poms couldn’t bowl another over or two in the final 5 or 6 minutes. Neither the middle order or tail could get many runs. We were bowled out in just 58 overs for 138 runs. One word could sum up that whole innings….Terrible. The Australians had a bad second innings but England still needed 354 runs to win. England had some good knocks here and there lead behind Joe roots 67 off 123 balls faced. Bairstow, Malan and Stoneman got a start but had no help. Woakes, Ali, Overton, Broad, and Anderson all combined for only 22 runs! Mitchell Starc was the pick of the bowlers picking up 5 wickets for 88 runs big he was going at 4 runs an over. England were all out for 233 runs which gave Australia the 120 run win making the series 2-0. The Perth test. The final test match that would be played at that oval. The first test played there was in 1970 on the 11th of December. 47 years and 3 days later the final test match would be played. The same teams, Australia vs England. Australia had made one change to their line up for this test. They decided to drop Peter Handscomb – who had made, 14, 36 and 12 prior to that test – and bring in Mitch Marsh. There was lots of controversy following that call. Yet AGAIN England won the toss. Joe Root-clearly not knowing whether to bat or bowl because of the first two tests – decided to bat first. Australia got their first four wickets conceding 131 runs. Cook made 7, Stoneman Got another good start but made 56, James Vince got 25 and Root 20. Malan and Bairstow were in together now, two batsmen struggling to find form. They were going along nicely, they bought up a 50 partnership, 100, 150, then 200 run partnership. Dawid Malan got the first century for England then Bairstow followed. Finally, Lyon got Malan to make his first error and Peter Handscomb – the substitute fielder – took a diving catch to dismiss Malan for a great 140 runs. Bairstow was still at the other end on 106. England were still looking to make a lot more runs with Woakes and Ali still in store. But they didn’t. Ali edged one to Smith at second slip on his second ball making nought. Chris Woakes hit one to backward square leg where Pat Cummins ran from fine leg and took and athletic diving catch getting Woakes out for 8. Bairstow was next after Starc bowled his middle stump out of the ground which meant he was out for 119. Overton bobbed one up to Bancroft the close in fielder who took a simple catch. Broad was the last to fall making just 12 before he also hit one to bat pad were Bancroft got another easy catch under the helmet. England lost their last 5 wickets for just 38 runs making 403. James Anderson was the not out batsman on 0. England being 5-368 would have been hoping to get at least 450 runs, but they failed to do so. Warner and Bancroft made twenties and Khawaja got 50. Shaun Marsh got 28. Captain Steve Smith and Mitch Marsh who was playing his first test for Australia on while put on 301 runs. Smith was a man on a mission getting 239 runs of 399 balls. Spectacular. Mitch Marsh faced 235 balls before getting out second ball of day 4 lbw (leg before wicket) for 181 runs. What a huge confidence booster that was for him. He proved all the doubters (including myself) wrong. One of the most amazing parts of his innings was that he did it in only 236 balls which gave him a strike rate of 76.69. A batting strike rate is how many runs a player gets per 100 balls. Most people get about 40 runs per 100 balls. Smith got the 4th highest score at the W.A.C.A. and Marsh got the 11th highest score. Tim Paine got 49 not out and Cummins got 41. Nathan Lyon getting out for 4 lead to Smith calling the declaration with Australia 9-662. A great score. It was actually the second highest score at that ground. Australia’s goal would have been to not Bat again which would be succeeded by getting the Poms out for less than 259. And we did with 41 runs to spare. Malan and Vince got fifties but no one else got a score above 22. The last wicket to fall was Woakes for 22 when he edged it to Tim Paine. As Mark Taylor (will double check later) said the little urn is back with the Aussie’s and yes, it was. The crowd was ecstatic. Australia had regained the urn! The Boxing Day test. Australia had already won the Ashes but were still looking to get the series whitewash. Mitchell Starc, who had only played one Boxing Day test match would miss yet another one with an injured ankle. He would be replaced by pace bowler Jackson Bird. Finally, Australia won the toss and chose to bat on the M.C.G. Wicket. Warner was getting his runs quickly and Bancroft was taking his time. Warner brought up his fifty in the first session. A session went by before England finally got the wicket of Bancroft for 26 runs. Warner was on 91 when Bancroft was out LBW. It took Davey so long to get his final 3 runs and when he was on 99 he got impatient and tried to smash England debuton Tom Curran, but popped it right up to mid-off getting caught. All the Australian supporters went quiet and the Poms rejoiced, I was lucky enough to be at the M.C.G. on day one which was awesome except for that moment. Warner punched his bat in frustration and walked off furious with himself for getting out on 99. Davey looked at the big screen hoping for a front foot no ball and sure enough it was. He strapped his gloves back on and next ball he got his Boxing Day hundred, as Mark Nicholas said “in the most dramatic circumstances”. Warner, however, got out not long after on 103. Khawaja was next out on 17. Smith and Shaun Marsh made it out to the rest of the day with Smith making his half century looking to get ANOTHER test match ton. Smith got to 76 on day two before he chopped one into his stumps giving Tom Curran his first test match wicket, and this time it wasn’t a no ball. Smith chopping one onto his stumps was the first of many in the match for the Aussies. Mitch Marsh only made 9 runs before he to chopped one onto his stumps. Shaun Marsh was next to go this time LBW off Broads bowling. Paine was batting nicely before he to dragged one onto his stumps for 24. Bird and Cummins got 4, Hazlewood 1 not out and Lyon got a ten ball duck. The Aussie’s batting collapse lead us to getting 5-13! 10-327 was the final score. Nothing much happened early in England’s innings except for another screamer caught and bowled from Nathan Lyon to get Stoneman for 15. Next to fall was Vince LBW. It was a bit controversial as he thought he may have hit it but Cook who was batting nicely at the time must have wanted to save the reviews for himself said not to review it. It turns out that he did hit it which means he shouldn’t have been out. Next in was Root. They batted for 44 overs picking up 138 runs. Root bought up his fifty as well. In the last over of day two – Steve Smith bowled it – Cook got his ten or so runs to bring up his ton. He played very well after only getting scores of (2 and 7, 37 and 16, and 7 and 14). Root got out in day three after Cummins got him to play the pull shot and it went straight to the safe hands of Nathan Lyon. Malan didn’t do much getting out on 14 and scores of 22, 20 and 26 from the middle order helped a bit. Tom Curran made 4 runs in his debut but when he got out Cook had already made 150 and was running out of partners much like Smith in the first innings in the Gabba test in Brisbane. Stuart Broad was to bat now and surprisingly he’s not that bad of a batsmen with a high score of 169! Something that also is not surprising is that the Aussie pace bowlers started off with giving him bouncer after bouncer and then he started to pull shots out of nowhere but they were working. Cook, who had been driving very well, bought up his double century with a straight drive that went for four. Considering Cook was about to get dropped from the England squad he defended himself very well. Mind you Steve Smith did drop him twice! Cook was showing no signs of getting out and neither was Broad as he made 50. When Broad found himself on 56 he played a weird shot and to Cummins and Khawaja ran in from the boundary and took a diving catch, so we thought at least. The umpires had a chat but weren’t sure if it was out or not so they decided to let the third umpire review it. The on field umpires’ soft decision was out which meant if after they reviewed it and the footage was inconclusive it would stay out. After a long look the third umpire gave it out. James Anderson and Cook batted out the day with Cook getting to 244 and Anderson 0 of 15 deliveries. The first ball of day four was a bouncer to Anderson and it caught his glove and went to Bancroft at bat pad. So Cook walked off not out as he batted through the innings making 244 runs, an amazing innings! England’s first wicket was Bancroft who was the fifth victim to play the ball onto his stumps getting out for 27. Khawaja only made 11 and Shaun Marsh got 4. Smith and Warner batted together for a while with Warner getting to 86 before he played a loose shot and got out. Mitch Marsh was now into bat. Smith and Marsh batted through the rest of the match with Smith getting a hundred to secure a drawn match. Mitch Marsh got 29 runs off 166 balls and said to Smith as they were walking off an hour early that he was extremely proud of himself considering he didn’t play his normal game and took one for the team. Alastair Cook got man of the match. The fifth and final test match of the Magellan Ashes Series. Australia, already 3-0 up in the series only fighting for a 4-0 win. Another special thing about the S.C.G. Test match is that it’s the pink test. On Day 3 the Australian community turns the S.C.G. Into a sea of pink wearing, pink shirts, glasses etc. This year Glenn McGrath-Australian former pace bowler – and his team set a goal of 1.3 million dollars to be raised for the Jane McGrath foundation. It’s also the 10th anniversary of his test and they change the ladies stand of the S.C.G. Into the Jane McGrath stand which is really nice. Back to the actual game now. Once again England won the toss-giving them a 4-1 toss lead which is what they would have hoped for in the real game – and chose to bat first. Australia got their first wicket in the 10th over getting Stoneman for 24, we then got Vince the same way as we got Stoneman. Caught behind off Cummins. The danger man Alastair Cook was going really well on 39 when Hazlewood bowled a beauty and hit the pads of Cook. The Aussie’s were appealing for ages but the umpire gave it not out thinking it was pitched outside leg stump (although it did look absolute plum). Smith challenged the call and it was overturned meaning Cook was on his way back the sheds. Joe Root and Dawid Malan batted for 133 runs before Root was out on 83 when he flicked the ball really square and Mitch Marsh took a diving catch. Root was nearly kneeling down devastated that he was so close to his first ton of the series but fell short yet again. England was to either bring in a night watchmen now or Jonny Bairstow, they decided on Bairstow which proved costly when he tried to drive a ball outside of stump from Hazlewood and found an outside edge giving Tim Paine a simple catch. That meant Australia got two wickets in the last two overs! Malan was first to go in Day two after Cummins found a very thick edge and Smith took one of the catches of the summer. The tail order did well with scores of 30 39 and 31 and then debuton Mason Crane only made 4 and Anderson 0 not out. Australia got England all out for 346 runs with Cummins getting 4 Wickets. Cameron Bancroft was first to go for Australia because of a pearler from Broad that went straight through him bowling him. Warner was batting well with Khawaja but when Warner was 56 Anderson found a slight edge and then got caught behind. Warner looked certain to make a hundred but fell short. Smith and Uzzie batted for 60 odd overs getting 188 runs. Smith was on 83 and Khawaja on 132 when Smith got out caught and bowled which was a surprise because that was the first shot he missed timed. Shaun Marsh was next in and he too was batting really well. Khawaja passed 150 and got 3 runs short of his high score before he got stumped giving Mason Crane his first test wicket. The two brothers, Mitch and Shaun Marsh also batted fantastic and both got their hundreds while batting together. When Mitch got his ton he ran 1 then halfway through the second run Shaun hugged him in the middle of the pitch, Mitch looked up in the stands and would’ve seen Smith screaming his head off for them to get back to their creases. Mitch Marsh’s celebrations were short lived after he got out very next ball for 101. Shaun Marsh got to 156 before he was run out. Tim Paine was not out on 38 and Cummins not out 24. As you would’ve gathered Smith declared on 7-649. We had a lead of 303. We got our first wicket in the third I’ve getting Stoneman for a 9 ball duck. The decision was given out but Stoneman reviewed it and the call stayed out. Next out was Cook when Lyon bowled him with a fantastic ball but the 4 balls before he got him out that over were what set the wicket up. Cummins got Vince for 15 and Malan went early for 5. Joe Root batted for a while with Bairstow to end the day of play. Joe Root retired ill at the start of the next day as he went to hospital because of dehydration. Which is not to surprising considering with the temperature in the middle of the S.C.G. Was 52 degrees!! (That is with the heat reflecting off things though) Moeen Ali got out LBW of Lyons bowling in day 5 for 13. After he was out everyone was surprised when Joe Root came out bat. Root got his 50 and was on 58 at lunch. He retired ill again but this time did not come back out to bat and he was actually asleep in the dressing room. Cummins got Bairstow on 38 runs. The Aussie’s were well and truly into the tail now. Cummins got Broad on his second ball and then Mason Crane in his fourth ball. Cummins was hunting for his fifth wicket and got close several times but didn’t get it. Anderson was the last wicket to fall after he got a slight edge to the keeper which meant the Australians had officially won the Magellan Ashes Series 4-0! In conclusion the Australians were too good for England in the test series and had more all round performances with five different players getting centuries compared to England’s three. The Aussies also had the top four wicket takers. I really enjoyed watching the Ashes in Australia because of the exciting play of the Aussies smashing the Poms each and every test. I was watching the Aussies play day in and day out which lead to me leaving the beach just to watch them play. I was lucky enough to go to the Boxing Day test on day one which wasn’t the first time I’ve been but it was the first time I had been to the Ashes and it was awesome. Well done Hugo! 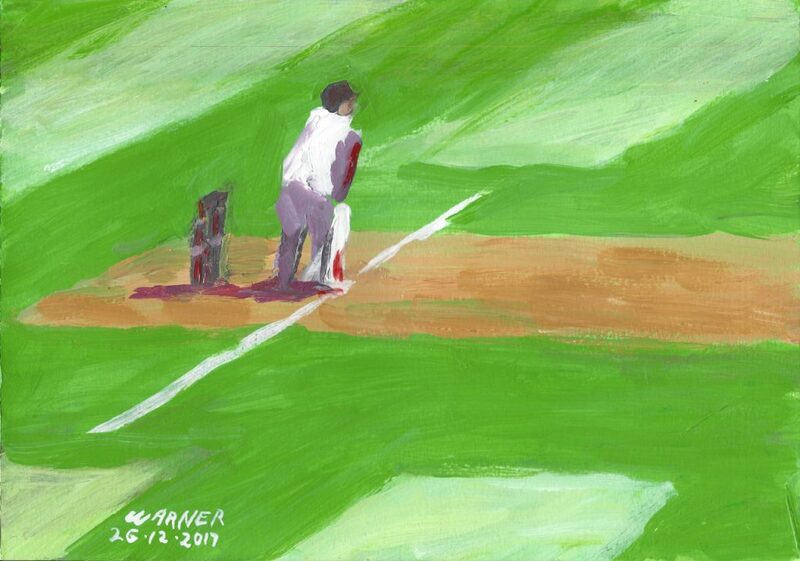 Hope that this is the start of a long career opening the batting for a media outlet accompanied by Mum’s paintings. Do you unfortunately barrack for Richmond? This may hold you back in the long term but never mind as it will be 30 years before they win another flag. All the best. Thanks Bob, i enjoyed writing about the Ashes this year, I do go for Richmond and Dusty will lead us to another premiership…. I hope! This was a great effort Hugo. Well done. You are set for life. Do you also fill out scorecards or is that a thing of the past? Thank you, it’s the first time I have done a writing piece like this and I enjoyed it, I’m not sure about the scorecard thing so it must be from the past! I just used the cricket Australia app. Fantastic roundup of the Ashes series Hugo. Thought our bowlers were magnificent and the main difference in the series. How is your cricket going? Thank you, our bowlers were definitely the difference they bowled extremely well and they were very consistent, my cricket team has to win the last two games to possibly make finals. Last year we made the grand final but lost.